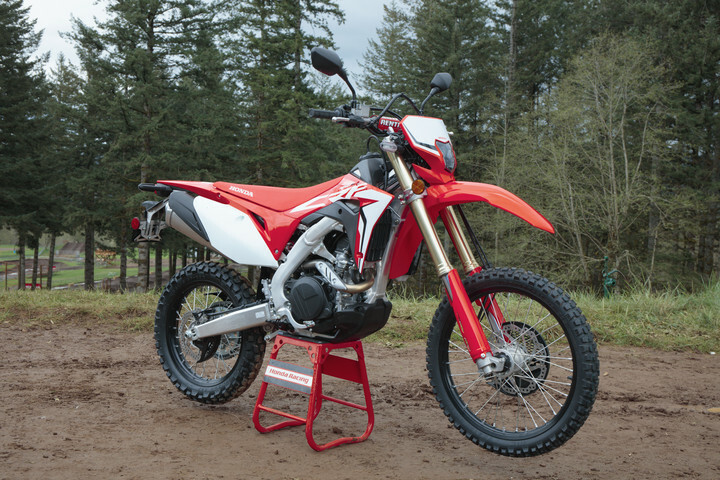 Know this: there are two specs of CRF450L. The US gets a barely-road-legal, ‘red KTM’ dual sporter for around $11,000. The UK and EU get a massively detuned, 25-hp Euro 4 version for an equally massive £9500. More here. While in Australia you get the 25-hp version for $12,999 AUD and, some say, a full-power ECU and race pipe in a box (and a voided warranty). 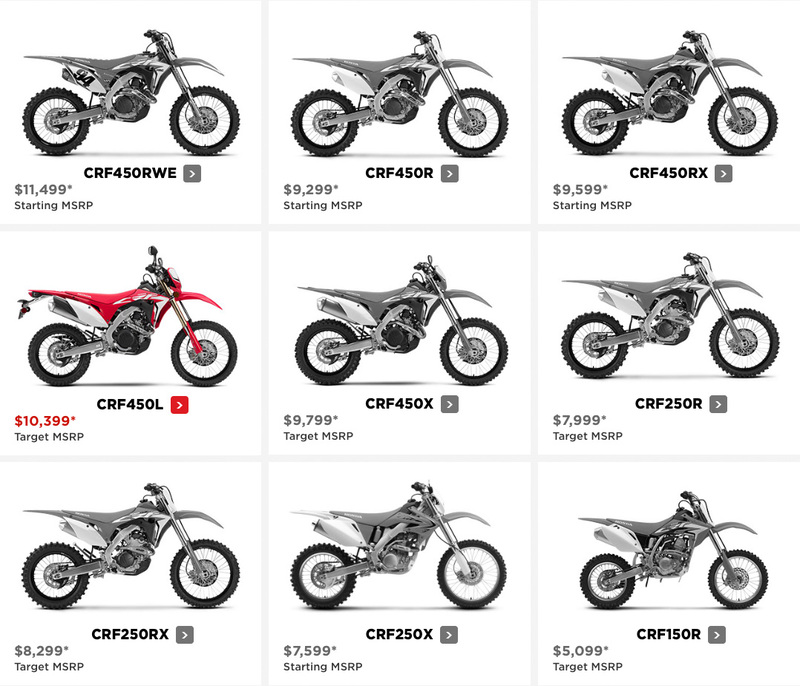 In May 2018 several people pointed me towards Honda’s announcement of their upcoming CRF450L. Was this finally the bike I’ve been droning on about for years? An ideal lightweight, all-road modern travel machine, based on the now proven CRF250L trail bike (right) which I bought myself soon after it came out? 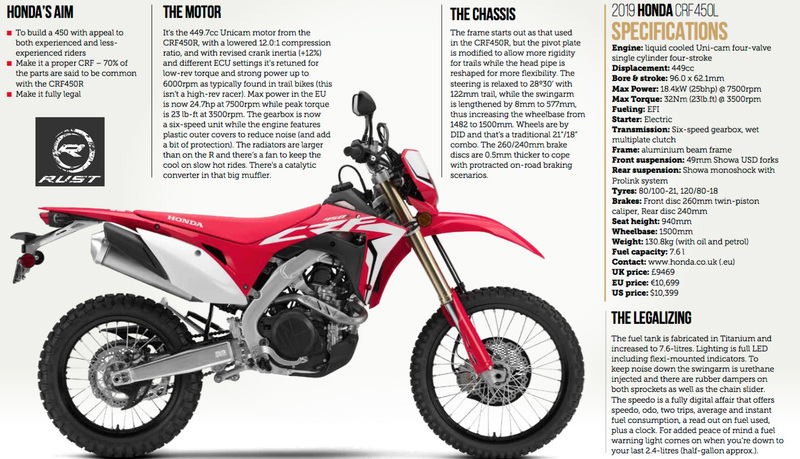 When I first noticed its very close resemblance to the long-established 450R dirt racer, or indeed the similar, street plate-able (in the UK, at least) CRF450XRL (right), I was disappointed. It was just a barely street-legal dirt bike for the US with the same yard-high razor saddle and crazy 50+hp with maintenance intervals measured in hours. Blink and you’d miss it among the spread of near-identical current Honda powersports dirt racers on the left. But, based mostly on the thoughtful preview on this unusually well informed enthusiast’s website (a Honda proxy?) I’ve given the 450L a second look. Images here are mostly all pinched from there, but are probably all Honda’s anyway. 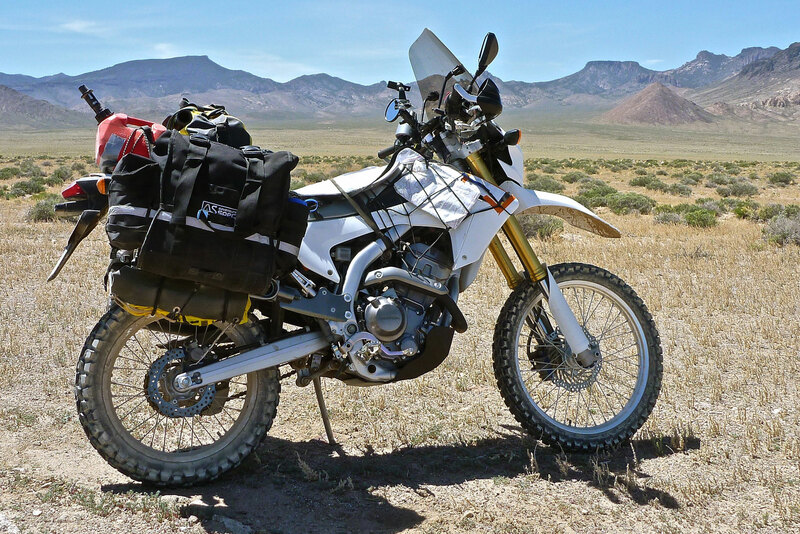 The problem has always been that Honda lacked a suitable 450 engine to stick in this dream all-road travel bike of ours. And on the road the 450 class seems a bit dormant. 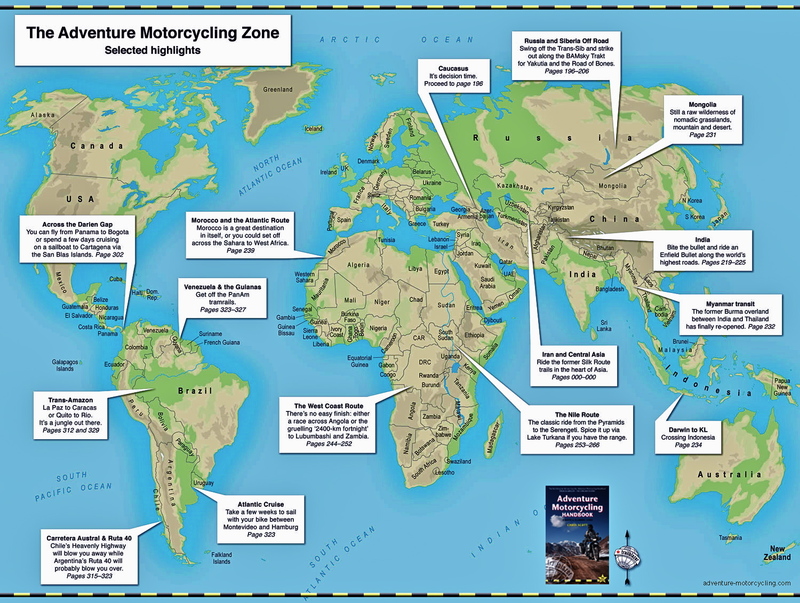 Plus, the idea of a rugged, lightweight adventure biking in the mould of CCM’s short-lived 450GP may be much talked about in our tiny adv echo chamber, but as we know, adventure motorcycling is really another name for big ‘sports utility’ bikes. Honda would never sell enough 450Ls to make it worth their while. 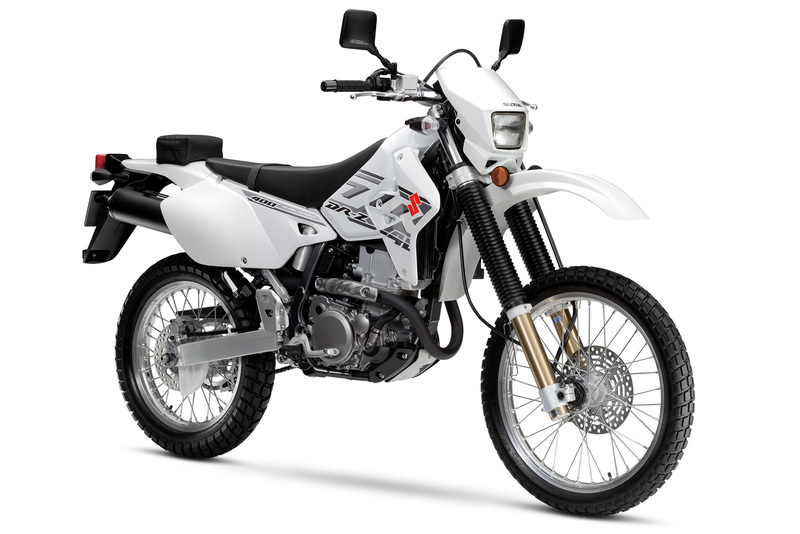 The 250L trail bike uses a heavy but durable CBR road-bike engine which in 2014 became a CBR300 with just 36 more cc but more bottom end. 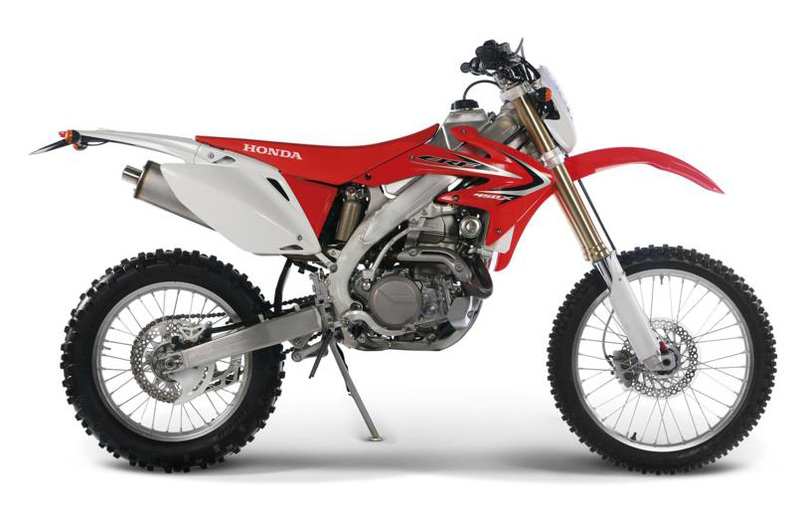 Some have been waiting for a CRF300L to follow or have shoehorned in CBR300 motors into 250Ls. But clearly you can’t squeeze another 150cc out of that barrel. What Honda have done for the Europe market seems unlikely to be successful: they’ve massively detuned a 450R racer by over 50% to the 250L’s outputor less than my similarly high-spec WR250R (left) which weighed about the same 131kg. To achieve this they added the lightest possible road-legal LED lights, a battery and decent alternator, a more durable three-ring piston, side stand, necessary emissions stuff including a cat and big pipe (weight to be saved there), cooling fans on the extra big rads, a wide-ratio 6-speed box, an 18-inch rear with the all-important cush drive and even a lockable fuel cap on the tiny but titanium tank. All they forgot was cool, rally-style bodywork (but see top of page) and a seat fit to sit on. All this adds 19kg over a 450R racer, but at 131 kilos that’s still pretty good. 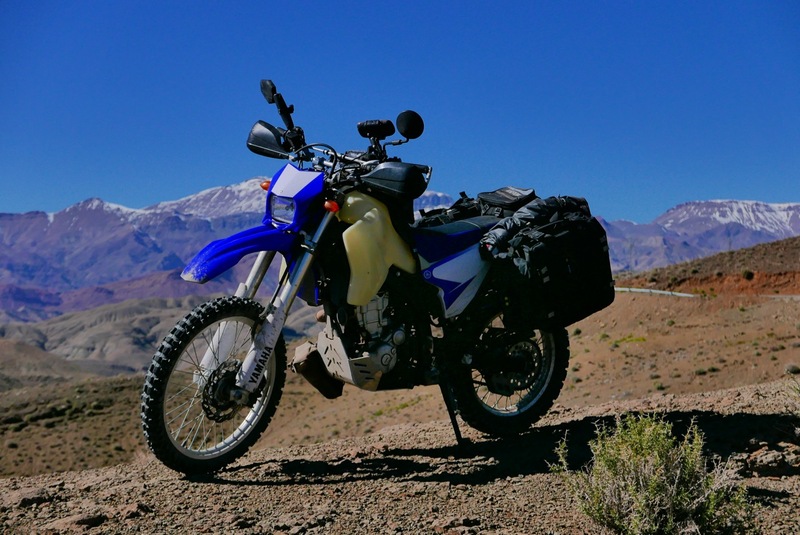 The power may be modest, but with compression down to 12:1, the claimed torque is 40% more than a 250L which, along with more crank mass, proven efi and six wide ratios, ought to make the 450L a tractable trail bike that’s less revvy and vibey on the road. It ought to be easy to lower too. Just a shame they couldn’t have managed another 10hp and normal oil change intervals. 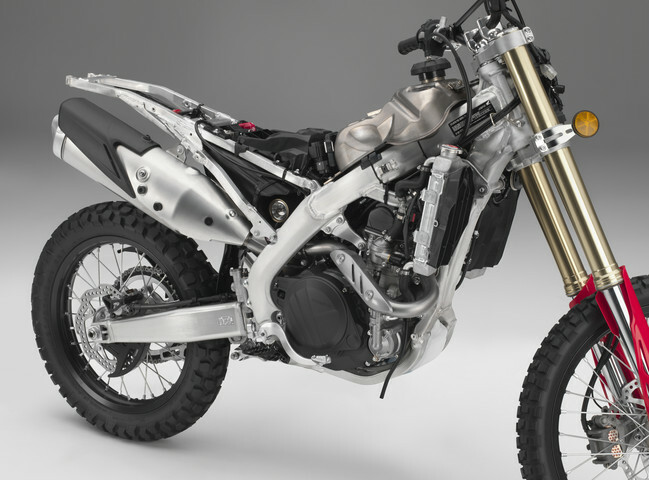 The new XR400? It’s as close as we’re going to get from Honda, not that the XR4 (right) was any kind of travel bike in its day. A great dirt bike for sure, but the tall saddle, kickstart and the frail subframe held it back for long hauling. I’m probably thinking of a modern DRZ400S (left), a proven if unsophisticated small travel bike which I’ve nearly bought many, many times. It’s been unavailable in the UK for a decade, but it’s still sold new in the US for under $7000. The question is: could the 450L’s claimed 25hp be enough? Possibly, if the bulk of it is available at lower rpm, but with the tiny tank and crazy ‘Africa Twin’ price, no one I know is that interested in finding out. 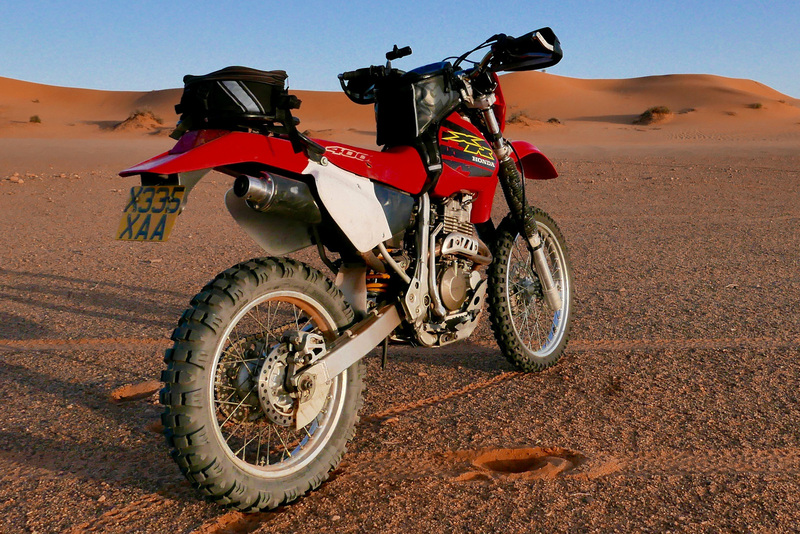 Update: over New Year 2018/9, Adventure Spec’s Dave Lomax (above) was exploring Morocco on a lightly modified 450L. Look on their Facebook for more. Rust magazine’s opinion (issue #40). This entry was posted in AMH News and tagged Honda CRF450L. Bookmark the permalink. 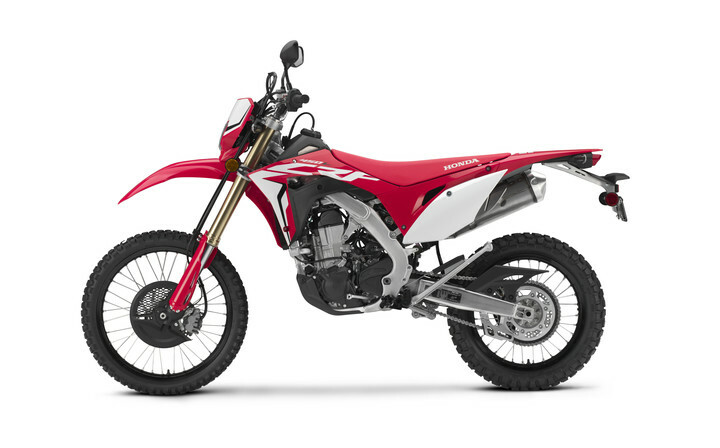 UK heading out of the EU gets Euro4-compliant restricted CRF450L; Italy staying put in the EU gets a 43 HP version of the above mentioned, courtesy of RedMoto, which they called CRF450XR and which comes with a Termignoni exhaust and Metzeler Extreme Enduro tyres.